This juicy mix of fresh summer peaches, brown sugar and cinnamon combined with a great batter recipe, in my opinion, produce the perfect peach cobbler. 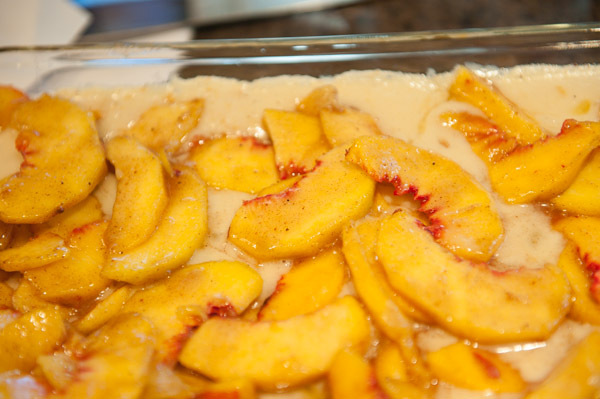 This is what the yummy Salt Lick Peach Cobbler should look like when it is ready to eat. Just add Blue Bell Vanilla Ice Cream, and you have a true Texas summertime treat! Here we go again. Years ago, many years ago, when Joel and I were students (him definitely yes, me so much) at the University of Texas in Austin (1968-72), barbecue restaurant was already an institution! If you have ever eaten there, (and I can’t imagine if you ever been to Austin and like barbecue that you have never eaten there) when you come out of the parking lot, the smaller building to the right was the original building. On the weekends, we would get our group and our cooler of beer together and go stand in line (usually for about 1 hour or more) for their delicious, all-you-can-eat, inexpensive BBQ. One weekend, we got the group and the beer together and headed out, but when we got there, there were no lights on. “What happened?”, you ask. Well, it was the all-you-can-eat part that got them into trouble! You see, if my memory is correct, they were recycling the food. To think I was probably eating food that someone else had touched, or, God forbid, even spit or drooled on was unthinkable! But…I guess being young and stupid, we were not deterred! As soon as they reopened, we were back in line…with our cooler, of course! While we waited on the reopening, we had to find a new favorite BBQ restaurant. That’s when we moved to The County Line Barbecue, which is also awesome! I’m actually not sure which one I like best. We go to one of the two every time we are in Austin. I do know I like the sides (and to me, good BBQ is all about the sides) at The County Line best. They also have a great patio that has an awesome view of the lights of Austin at night. There is now actually a newcomer on the Austin BBQ scene that is getting rave reviews, Franklin BBQ. It used to be a food truck (Austin is food truck heaven! ), but now they have a permanent facility. I must admit we have never eaten there, as the line starts long before they open and when the BBQ is gone, it’s gone! Some people even pay others to stand in line for them…imagine that! So, the closest I’ve gotten to Franklin BBQ, is to read about it. Lots of famous chefs stop in there when they are in Austin. Some even make a special trip to Austin to check this place out. I have a feeling they do not stand in line! 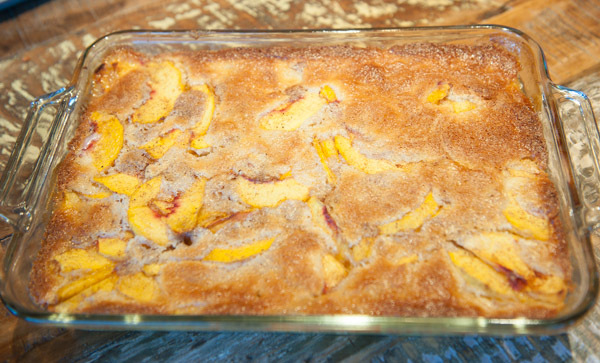 Back to the original reason for this post..the Salt Lick Peach Cobbler! This is the best peach cobbler I have ever eaten, and lots of people I have prepared it for would agree. You may as well know now, I am not a huge fan of cobblers, crisps or pies (that is, unless they include some sort of chocolate). If I do eat it, it’s all about the crust or the flavor, not the fruit! This cobbler has a great crust and an even better flavor. And the best part…it is so easy to prepare. It’s a great entertaining dessert, as it can be preped ahead and baking as your guests arrive, making your kitchen smell like heaven. If it happens to be done before you’re ready for dessert, not to worry…just microwave it for a few minutes to get it warm enough to melt the ice cream, which has to be Blue Bell Homemade Vanilla, of course…no questions asked!! If you have ever had Blue Bell Ice Cream, then you know why. 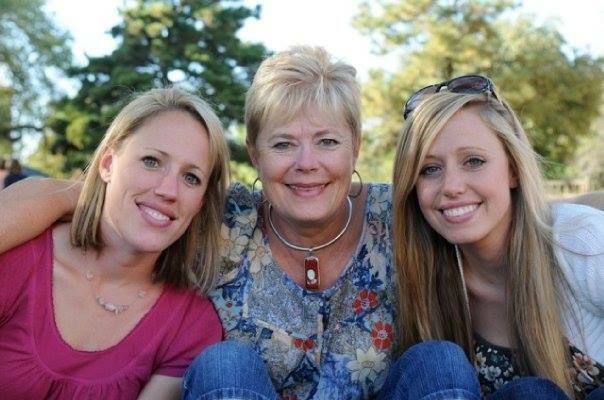 If you haven’t experienced the awesomeness of Blue Bell Ice Cream, you might want to think about finding some to try! I have to admit, I have never actually eaten this Delicious cobbler at the Salt Lick Restaurant. There is never any room left for dessert! My first taste of “Cobbler Nirvana” was at my brother-in-law, Stuart’s home. I knew immediately, I had found my favorite cobbler. This time, I prepared it as dessert for the dinner I was in charge of on our September trip to Joel’s brother, Neal’s, summer home in Idaho. Once again, success! I have prepared this awesome cobbler for casual backyard barbecues and for fancy gatherings, and everyone seems to love it! I almost always get lots of requests for the recipe. 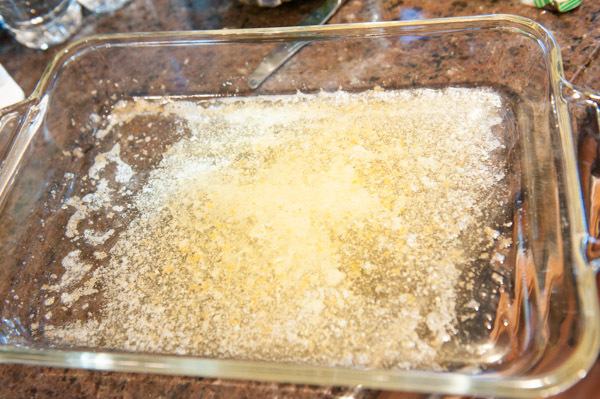 Melt the butter in a 9″ X 13″ baking pan. Fresh peaches scream “summer” to me. Hungry yet? Evenly arrange the sliced peaches over the batter. Do not stir! 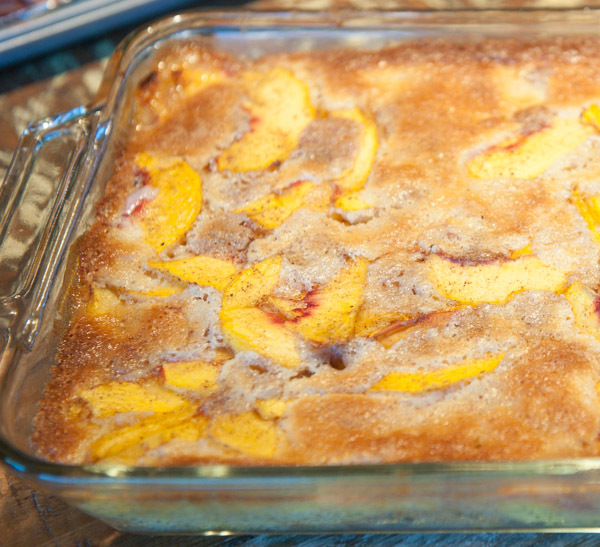 This cobbler is at its’ very best when it is made in the summer with fresh peaches. If you can not find fresh peaches, use good-quality frozen ones. I would not use canned peaches (even though that is what the original recipe calls for)…not even close to a fresh peach! Bring on the Blue Bell!! Put the butter into a 9"X13" Pyrex style baking pan. 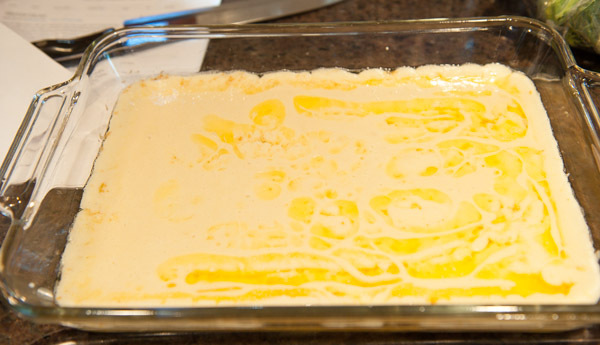 Place the pan in the preheated oven to melt the butter. In a medium sized mixing bowl, stir together the flour, sugar, baking powder and salt. Stir in the milk and beaten egg until all of the ingredients are well combined. Remove the casserole from the oven and pour the flour mixture evenly over the melted butter. DO NOT MIX. In the same bowl you used for the flour mixture, toss together the peaches, sugar, cinnamon and nutmeg. 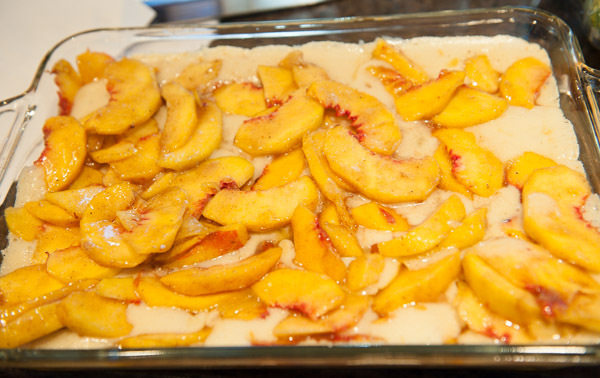 Spoon the peach mixture evenly over the batter in the casserole.....DO NOT STIR. 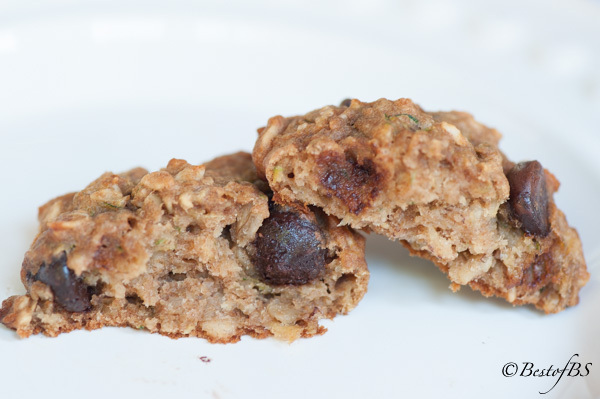 Bake in the preheated oven for about 35 to 45 minutes, or until the batter rises to the top and is golden brown. Do you peel the fresh peaches? If so, how do you peel the skins–slightly blanched for easy removal? I do peel them. I do not blanch them. I simply use a sharp paring knife, and it goes very quickly. Blanching may be a goo d idea. I’ll have to try that…I wonder if it is like blanching tomatoes?